This reproduction depicts a great looking vintage Home front World War II poster. 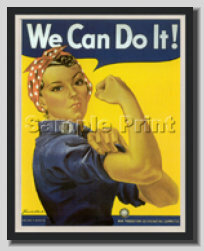 Depicts the working women’s hard work while the men were out fighting in the War. Artist J. Howard Miller 1942. Helped promote PRIDE and HONOR in our military and country.